Dazo Hall inside Philam Village has just recently gotten a facelift through new paint. 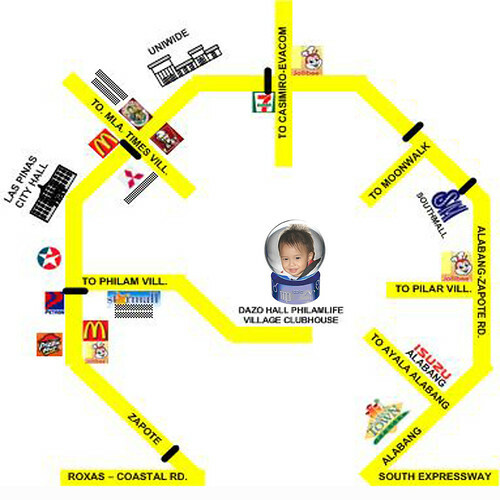 2) Turn right at the road immediately after Fernando’s (which is now part of Starmall). This will take you into Philam Village. 1) From South Expressway take Northgate /Filinvest Temporary Exit or Alabang Exit. If you took the temporary exit, going straight should take you to Alabang-Zapote Road. If you exit through Alabang Tollgate, turn on the first right to bring you to Alabang-Zapote Road. 2) From Alabang Zapote Road, take an estimated 25 – 35 minute drive towards the direction of Zapote. You’d be passing Alabang Town Center, SM SouthMall, Casimiro Village, Uniwide Las Pinas, and Las Pinas City Hall. 1) Take a Bus with the sign board Moonwalk / BF Pilar. 4) Look for the Tricycle station at the back of the former Fernando’ Supermart (For reference the Tricycle station is opposite Mercury Drug). 5) Take a Tricycle and ask the driver to bring you to Philam Clubhouse. 1) From EDSA take a Bus with an Alabang signboard. (Buses going to Pacita or Calamba may be used if they will exit in Alabang). 2) In Alabang, ask for the Jeepney Terminal going to Zapote. 3) Ride a jeep with the Zapote or Baclaran Signboard and ask the driver to drop you off “Fernando’s” (FYI: Fernando’s Supermarket is now part of Starmall). 4) Note that the Jeepney ride would take around 35 – 45 minutes to your destination, so an alternative is to go down Pilar and ride an Aircon bus from there going to Fernando’s. 6) Look for the Tricycle station at the back of the former Fernando’ Supermart (For reference the Tricycle station is opposite Mercury Drug). 7) Take a Tricycle and ask the driver to bring you to Philam Clubhouse.